So you think you can outrun the wind? Sailor Uranus is here! 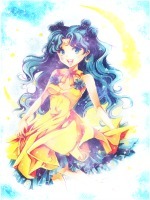 You can call me 'Uranus', 'Akiko', 'Aki', or 'Ayu'. I'll respond to either. I'm a senior in college majoring in Visual Communication, a.k.a. Graphic Design, specifically in Illustration. After graduation I'll be enlisting to the U.S. Navy for Mass Communication. So expect me to be on LOA for at least 2 months early summer 2014. For any other questions feel free to ask me in my Ask Sailor Uranus thread. I'll answer as soon as I can! OMG Your run pokemon tournaments! :O Coolies! I never understood the training card game as a kid. I just collected the cards. Yep! We have an event coming up next month! It's the lowest tier tournament for the next Play Season! The trading card game is actually really easy to pick up unlike Magic The Gathering. Mostly if you make a deck to play it almost identically every time and keep the consistency, you'll have a greater chance at winning, but luck is the major factor in the end. I made fun decks to play with others at League and just to mess around, but I mostly collect cards because I love the artwork. I remember as a kid I tried playing the game with a friend, but in the end we made up our own rules. We ignored the energy cards. XD I have been wanting to play actually. But my cards are probably soo out of date. I stopped collecting them in the middle of Johto. Then when gen 5 came out my friend and I bought a single pack for fun. I have no idea where they went too. The artwork has changed so much since Johto. Lol indeed they have. You can also download the TCG online game where you can a standard deck on your own and play that way if you wanted. You don't have to buy any cards, though since most of the players do buy card with the special booster pack codes, they basically make their RL deck their online deck as well. I might try it some day. Keep your Magic away from me. That game was evil and owned me. No. I never paid for my 5K plus cards, they were all given to me. The beauty of being a volunteer worker for a game store. magic like WoW ate my life. really, It's fun and all but I cant anymore and pokemon is just as bad. I played with my brother (the things I will do to spend time with my kid siblings) we used to go to the local BAM and play on the weekends. it was fun but it ate a lot of time. Yep! It is indeed. I can easily spend 4+ hours categorizing my cards. and thus i am out. Subject: Re: So you think you can outrun the wind? Sailor Uranus is here!